Midway through the 1936 racing season, no one could have predicted the bay colt foaled and raised at Claiborne Farm and campaigned with moderate success by his breeder, Wheatley Stable, would soon begin his ascension into legend. After a juvenile season where he started thirty-five times and a dozen starts at three, Seabiscuit was acquired by automotive dealer Charles S. Howard and placed into the hands of future Hall of Fame trainer “Silent Tom” Smith and jockey John “Red” Pollard. The rest, as they say, is history. Showing a hint of what was to come with two stakes victories at Bay Meadows at the end of his sophomore year, Seabiscuit rose to the top of the racing world in 1937. Setting four track records, he won eleven of his fifteen starts, ten stakes and he topped the earnings list with $168,580. He was named Champion Handicap Horse. The most popular horse in training, fans clamored for a meeting between Seabiscuit and the 1937 Triple Crown winner War Admiral. 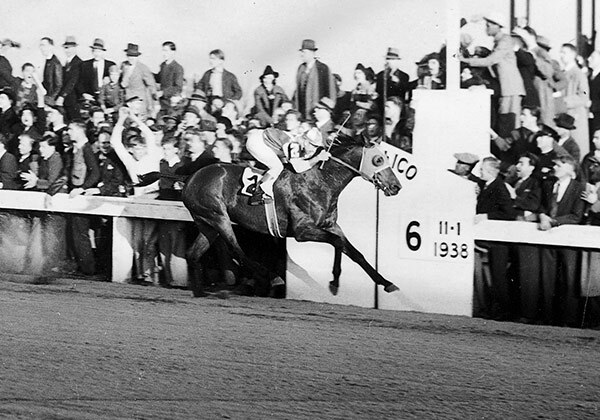 The Pimlico Special match race finally took place on November 1, 1938. Broadcast nationwide, Seabiscuit went wire-to-wire, winning by four lengths and setting a new track record for a mile and three-sixteenth. Seabiscuit was named Horse of the Year and Champion Handicap Horse. Injured early in 1939, he returned in 1940, making one last attempt to win the Santa Anita Handicap and to break Sun Beau’s all time earnings mark. In fairy tale fashion, he won the Big ‘Cap by four lengths in track record time and retired with a record bankroll of $437,730. He died at age 14 at his owner’s Ridgewood Farm in California.